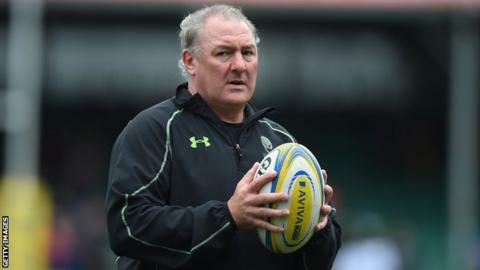 Director of rugby Gary Gold is to leave Worcester Warriors at the end of the season and take over as head coach of the USA national team. The 50-year-old South African joined Warriors in January this year and guided them to Premiership safety. Gold signed a new one-year deal in April and will see out his contract with Warriors, who are bottom of the table after five defeats from five. Chairman Bill Bolsover said he was "disappointed" to see Gold leave. But he said he "fully understood" his desire to coach at an international level. "We are working with Gary to ensure we can appoint a director of rugby who is capable of building on the good work he and his coaching team have done this year, and someone who is able to take us forward as Gary has done," added Bolsover. "We are confident Gary will be able to oversee a successful season for the club before he takes on his new position." Worcester are bottom of the Premiership table on one point, with their last victory coming against Bath in April last season. Gold added: "I have thoroughly enjoyed my time at Sixways and my focus will remain on Warriors until the end of the season, where I hope to leave the club in a strong place to ensure it can be successful in the long-term."